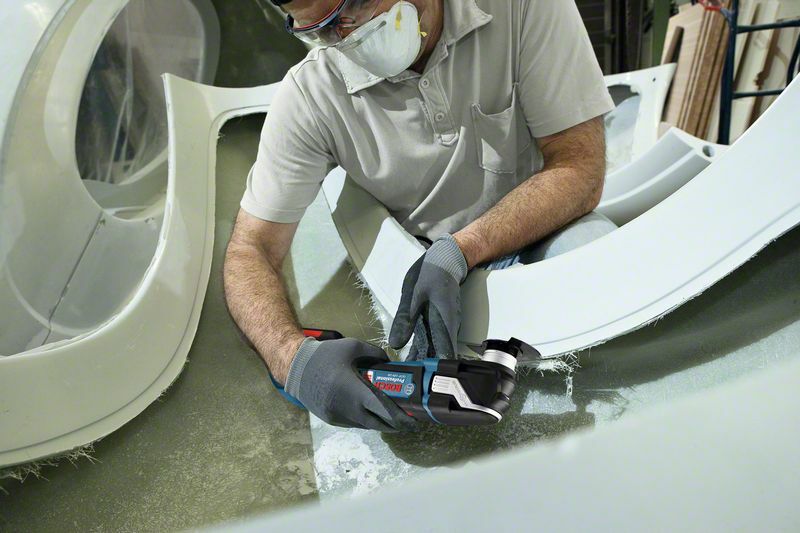 The GOP 18V-28 Professional cordless multi-tool is a versatile and powerful performer in the Bosch StarlockPlus category. Its superior Starlock interface with an optimised 3-dimensional tight-fitting connection between the machine and accessory delivers the highest possible power transmission for faster working progress. The multi-tool also features an LED spot, illuminating workspaces and improving work visibility even in the dark. Furthermore, its Snap-in function enables fast and easy tool accessory changes. This tool is intended for furniture cutouts and boat renovations as well as pipe and nail cuttings. It can be used in wood, plastic, and metal. It is compatible with the Starlock and StarlockPlus systems. The GOP 18V-28 Professional also includes features such as Constant Speed, soft grip, and Speed Selection. Free warranty registration for Bosch Professional tools and measuring tools. The Bosch service will quickly repair your Bosch tools or provide you with matching spare parts.